A pair of gray wolves have settled into their habitat at Oakland Zoo’s upcoming California Trail, opening in June 2018. "Our hope is Sequoia and Siskiyou will inspire people to respect and connect with the Gray Wolf, their species having been extricated from our state out of misunderstanding and fear"
A pair of gray wolves have joined the list of eight new native-Californian species at Oakland Zoo’s upcoming California Trail expansion, opening in June 2018. These two wolves, Sequoia and Siskiyou, arrived in late December and zookeepers have been conducting ‘wolf acclimation training sessions’ with exposure to small groups of people to give them ample time to adjust to their new two-acre home. Born in captivity, these two wolves represent a much larger and inspiring story of wolf conservation in California. 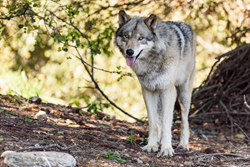 Wild wolves are now returning to California - after being extirpated during government-run antipredator campaigns a century ago. Sequoia and Siskiyou, both five-years of age, relocated to Oakland Zoo as part of a multifaceted partnership with the Zoo and California Wolf Center (CSC). With the arrival of Sequoia and Siskiyou, the Zoo and CSC are working to engage the public’s support for the safe return of their wild counterparts to our state. By sharing the whole story of wild wolf recovery, including that of ranchers living with this predator, opportunities are created for people in taking action for wolves – such as buying ‘predator friendly beef’. “California Wolf Center is honored to be working with Oakland Zoo to provide a dynamic new home for gray wolves, Sequoia and Siskiyou. We are excited for this pair’s future in the Bay Area and have the utmost faith in Oakland Zoo staff to provide an extraordinary life for these animals,” said Christina Souto, California Wolf Center’s Director of Marketing and Communications. The partnership with California Wolf Center goes beyond the Zoo - to direct involvement in the conservation of wild wolves. Oakland Zoo is sponsoring the Wolf Center’s Range Steward program. Range Stewards are trained ranchers working to rekindle the ‘herd instinct’ in cattle, thus reducing the chance of wolf-livestock conflict. These actions increase connection and tolerance of ranchers, ensuring livestock are safe and wolves achieve long term recovery. "Our hope is Sequoia and Siskiyou will inspire people to respect and connect with the Gray Wolf, their species having been extricated from our state out of misunderstanding and fear,” said Amy Gotliffe, Oakland Zoo’s Conservation Director. This pair will also represent the exciting return of the Gray Wolf to California, and how Oakland Zoo, California Wolf Center, and California ranchers are teaming up to protect and restore this important species." Sequoia is a male wolf and was born at the California Wolf Center. He is described as very sweet with a dominant personality. Siskiyou (female) was born at McCleery Buffalo Wolf Foundation in Montana. According to staff, the five-year-old pair appears to be getting along very well. Wolves, unlike dogs, commonly mate for life; therefore, they take time to develop relationships. Oakland Zoo hopes Sequoia and Siskiyou will have a litter of pups next year. Creating a natural pack is important to the emotional health of wolves. Pups born to the pair will remain at Oakland Zoo, in the same habitat as their parents. The wolf habitat at Oakland Zoo’s California Trail is 2-acres, complete with a pool, trees, dens, and plenty of cover for these elusive animals. Discussions began around the construction three years ago to ensure that wolves moving to Oakland Zoo would be housed in the most comfortable space possible. The California Trail at Oakland Zoo opens to the public in June 2018. Oakland Zoo, home to more than 700 native and exotic animals, is managed by the Conservation Society of California (CSC); a non-profit organization leading an informed and inspired community to take action for wildlife locally and globally. With over 25 conservation partners and projects worldwide, the CSC is committed to conservation-based education and saving species and their habitats in the wild. Oakland Zoo is dedicated to the humane treatment of animals and is accredited by the Association of Zoos and Aquariums (AZA), the national organization that sets the highest standards for animal welfare for zoos and aquariums. For more information, go to http://www.oaklandzoo.org. The California Wolf Center is dedicated to the recovery of wolves in the wildlands they once roamed. We envision a landscape where wolves thrive in healthy ecosystems and wolves and people successfully coexist. Our organization is at the forefront of creating a new model for long term wolf recovery through a scientifically based, socially acceptable approach that provides real and practical solutions to those sharing the landscape with wild wolves. We offer tours of our conservation center in Julian, CA with a reservation. Visit http://www.californiawolfcenter.org or call 760-765-0030 for more information.